There is a giant, 5 day Blog Hop-Hop-Happening online which begins with the wildly popular Sew We Quilt blog spot. It began yesterday and it's called "Think Christmas". All the participants post one or more blocks with a holiday theme and I am quite taken with many of them. 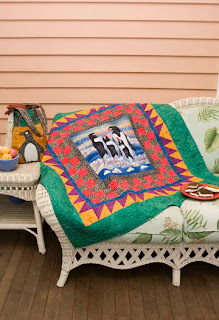 I spotted this yesterday on Linda's blog (Living for Quilting) because in the bottom left hand corner is a page from my Block a Day Calendar! Wow! 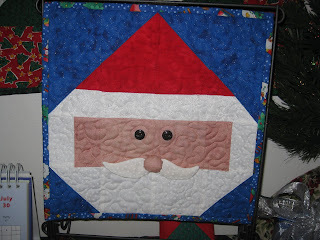 But, you have to admit, her Santa block is AWESOME and she gave me permission to repost him here today. 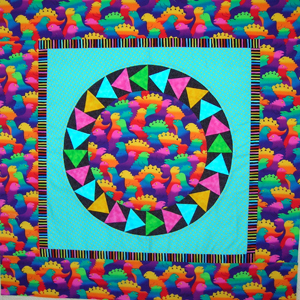 If you want to be inspired and learn some neat tips with tutorials, start out at the Sew We Quilt blog and just hop, hop, hop to a variety of quilting blogs. It's an easy way to stay cool in the middle of a very hot summer! Here is my penguin quilt that never, ever got picked up by a magazine. I call it "Chill" and notice the fun penguin bag over on the table. 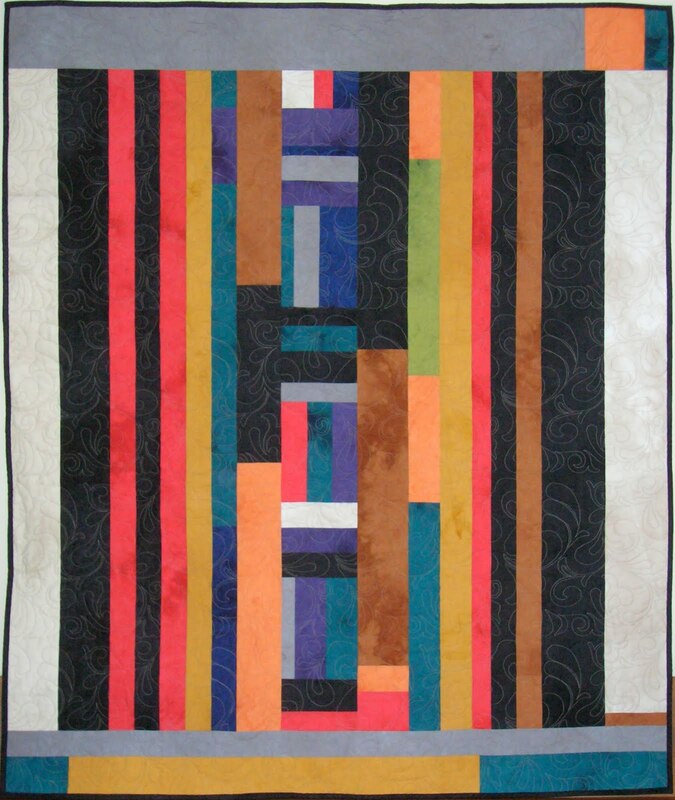 I used this quilt in my Building Blocks & Borders workshop to teach how to add rows of borders that fit. 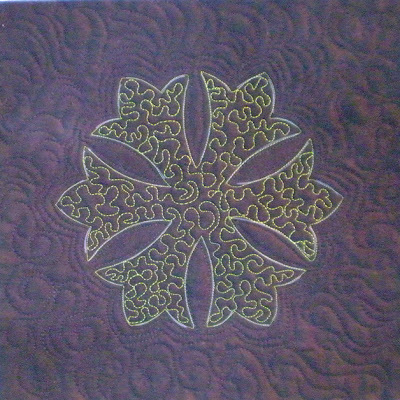 We all have these beautiful batik panels and never know what to do with them. 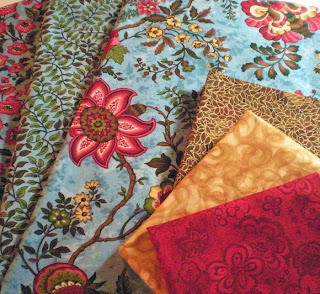 My editor had given me one and I set to work using beautiful batiks by Island Batiks. I bring this out in the winter and hang it in my kitchen. Chill! 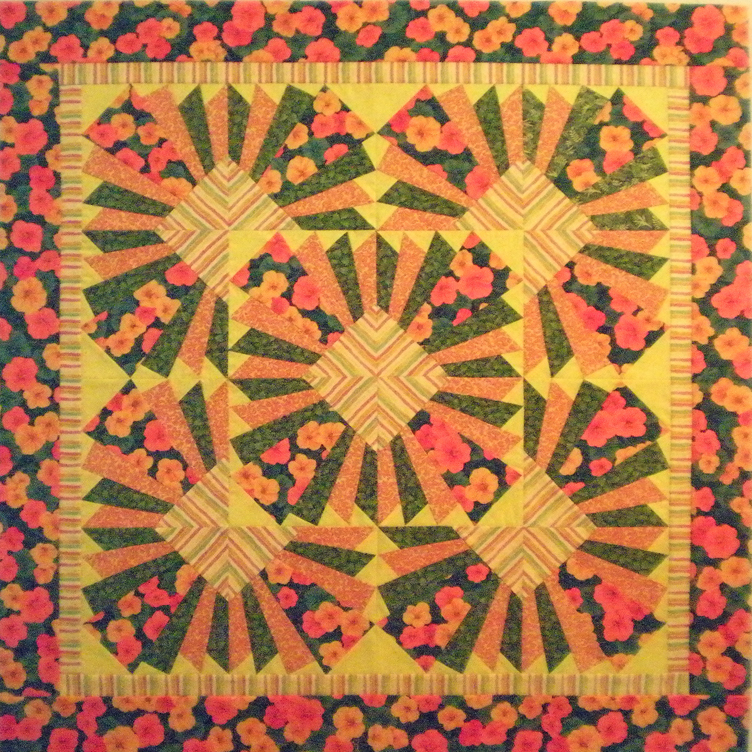 Quilt - 48" x 48"
Oh, my gosh! I actually found the pattern on my computer and it's done up in pdf! I will offer it here for a limited time. You are free to download, print and make the pattern, but please don't redistribute it. Send people to my blog to get it. Today is Monday and I've been busy over the weekend sewing with an upcoming line by Blank Quilting called Noblesse. They are very romantic in feel and while there are only 3 fabrics in each of the two colorways, the main fabric provides other possibilities as shown in the pic above. 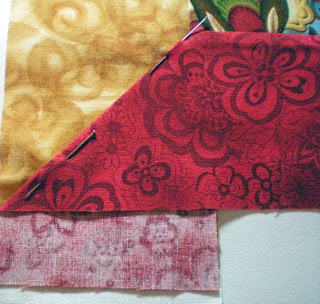 I selected 3 of Blank's blenders to go with my 1/2 yard cuts. Did you know you can do a LOT with 1/2 yard cuts? No? Then allow me to show you! 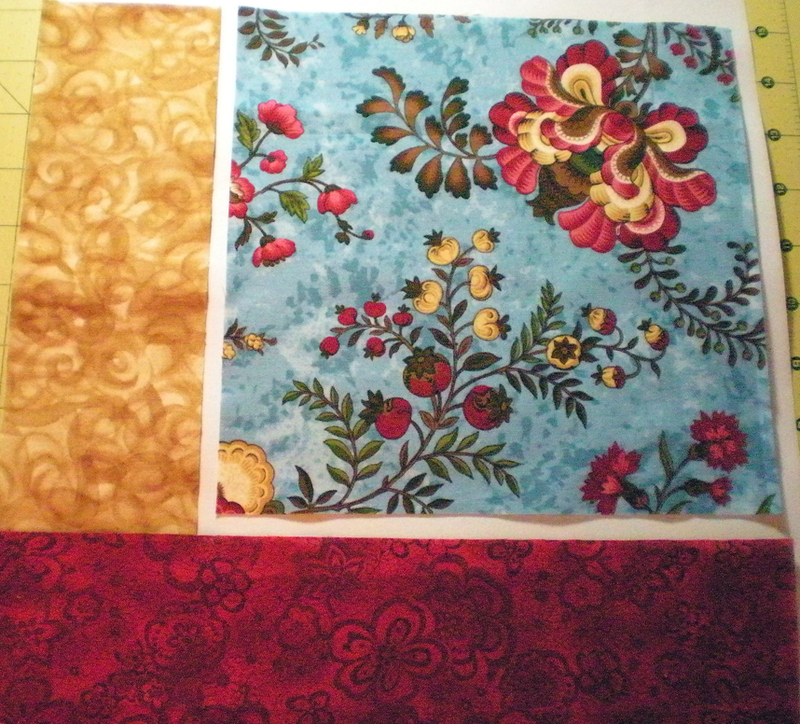 I will upload more pics, the finished quilt tops (yes, 2 tops) and a chance for you to win some PRIZES - FABRIC! I will send out another blog update, so you need to be on my list to get that info so you can enter. Here is my Magical Mitering technique which is used for these Attic Window blocks. I will reveal more as the week goes on, but first to show you how I created the blocks. Since I was working with only 1/2 yard cuts, I couldn't afford to fussy cut the flowers. So, I let my rotary cutter decide for me. 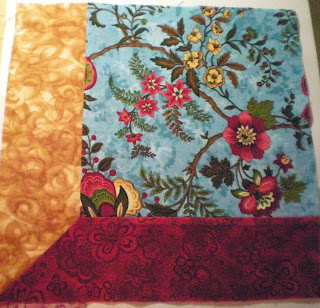 I was able to get 9-10 squares 8-1/2" x 8-1/2" from my main fabric. Then, I cut one strip each from my latte and red fabrics, 3" x 12". I sewed the latte strip to the left side, extending the seam a little beyond the center square because I NEED to see that seam for the next step. 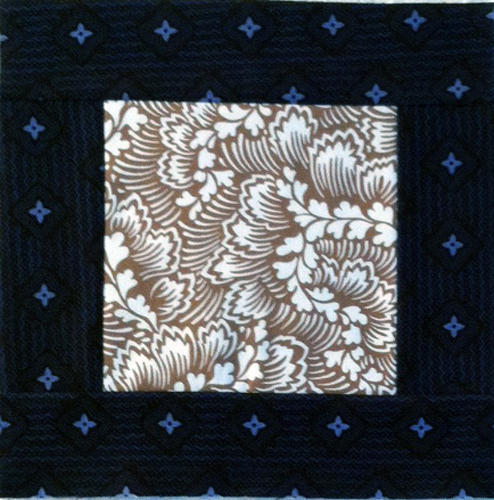 I also pressed the strip TOWARD the square (not away from as would be typical). Again, there is a REASON for this. Really, you say? Really, just stay with me. Place the red fabric as shown and using the extended seam as your visual guide, drop your sewing machine needle exactly where it comes out. This way, you don't have to guess where the 1/4" seam is; you can see it! Sew 1/4" from that point to the end of the strip. 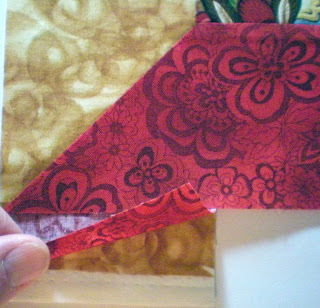 Turn the block over and fold the red fabric under at a 45 degree angle (like a typical miter). Press with an iron. Notice that the inside edge of the red fabric aligns with that exposed edge of the latte strip. That's why we pressed the seam TOWARD the center square. It makes for a perfect alignment (and doesn't create a nasty bump). 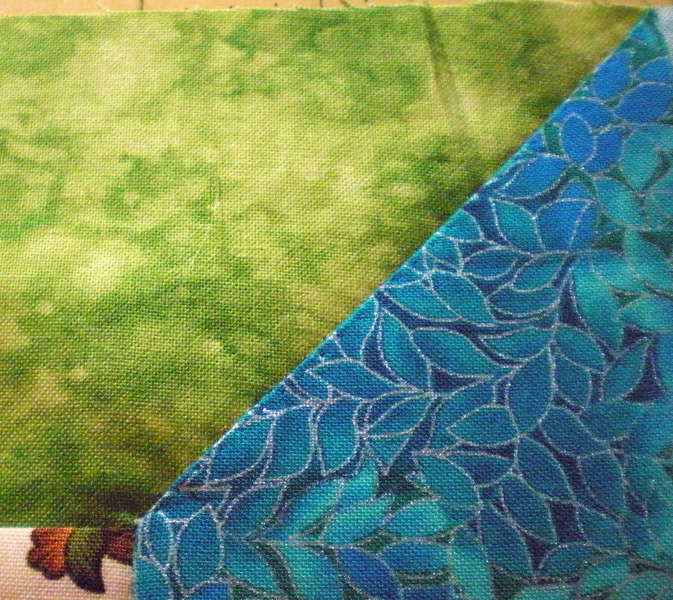 Here is the back of the miter showing the small zig zag stitch (I show the 2nd colorway in this pic). Pin as shown. Go to sewing machine and using either matching thread or invisible poly thread, stitch from the inside outward (never the other direction). 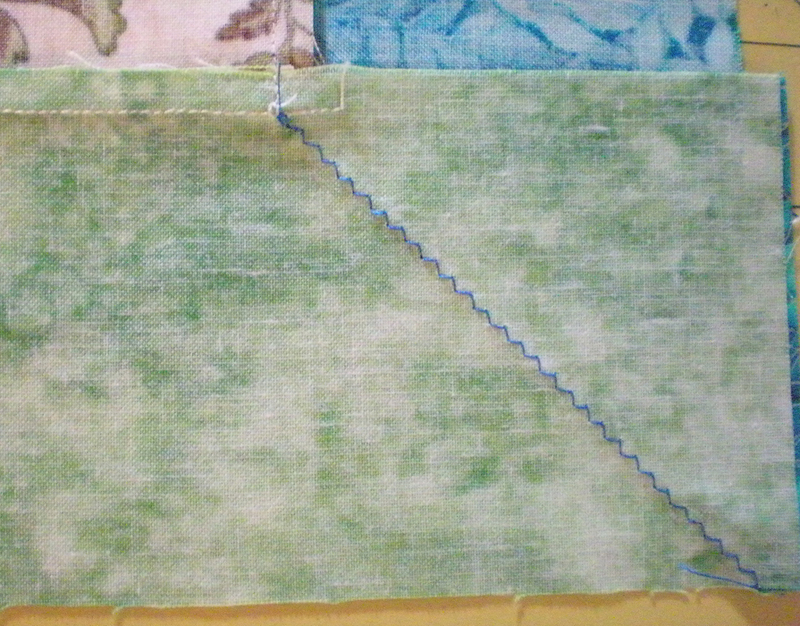 I do not use a straight stitch, but a narrow zig zag stitch. It is virtually invisible. OK? What does the front look like? No kidding!! You cannot see the stitches and you didn't have to wrestle an alligator and pray to the fabric gods to make your miter behave. You have total control. You turn the block over and cut away the excess fabrics, leaving 1/4" away from the stitching. Lookout, Pittsburgh/Monroeville Original Sewing and Quilting Expo! 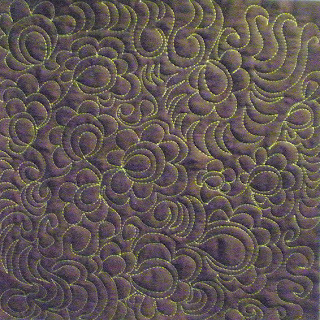 I am bringing my dark fabric for one of our machine quilting samples. 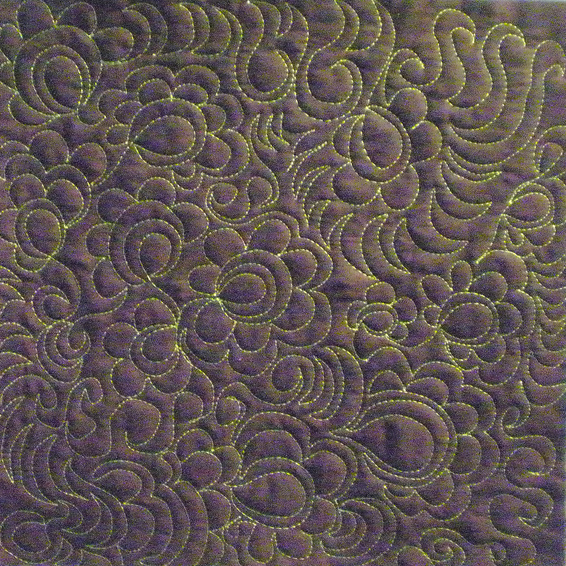 I love the way colored threads standout and then matching thread for the background enhances the design. I am NOT a professional longarm quilter, but I do love to go dancing with the feed dogs down! Yes, the white you see is the chalk marking pencil and I plan on keeping it there to show my students. Black batik fabric, poison green thread, and me! Nothing planned, just letting my inner self take over. I really had fun creating these. This was part of a magazine several years ago. All their quilt designers were asked to share a favorite recipe. I swore I wouldn't add recipes to my blog, but we all have to eat to keep up our strength to read blogs, right? I might even show some pictures of my sweat shop - oops!, sewing room! I cleaned it yesterday (not planned, but I couldn't move in there anymore) and now I can see my fabric! These are my HAPPY colors! This is just like how I feel with my fabric - it's the bright, happy colors that give me great pleasure when I sew. The same is with yarns. Now why did I buy those muted grays and mauves in January? Could it have been the weather? The yarn above is about $8 a skein (and I paid $.50 for my purple skein at the thrift shop). I am looking for some of this in any colors that will go with my 10 skeins above. The hunt is on! 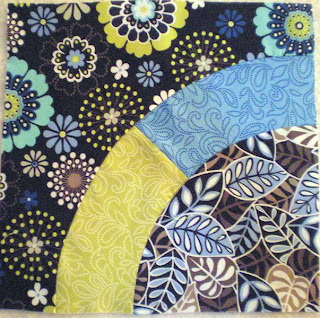 Moonstruck Quilt - 62" x 62"
See the fabric swatches at the Windham Fabrics web site. This will be a FREE PATTERN in August! 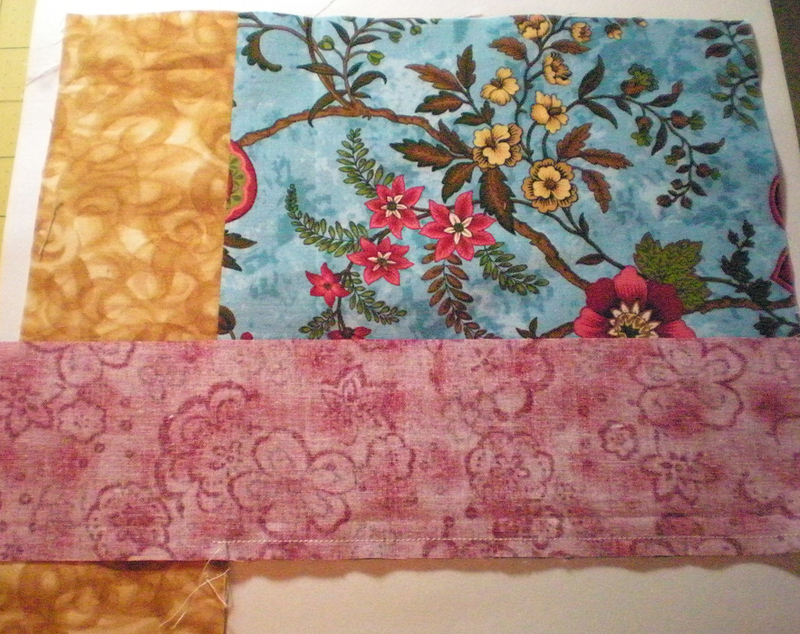 Here is a sneak peek at some upcoming fabrics and the pattern I have designed to go with them. 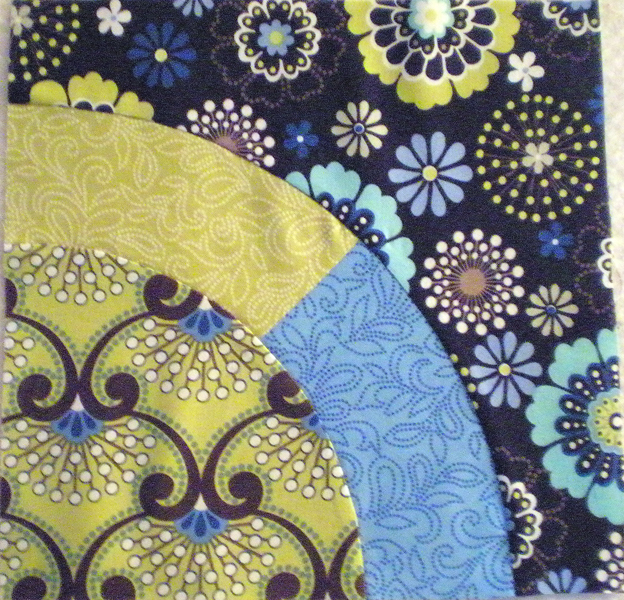 Today I feature the two blocks (same pattern, different center 1/4 circle) which will make up the full quilt, size 62" x 62". 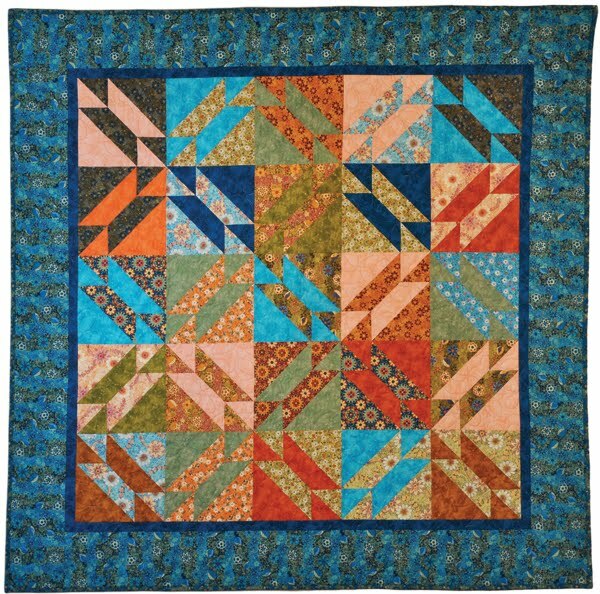 The fun part of this quilt is that it uses 16 of these blocks in a fun arrangement. 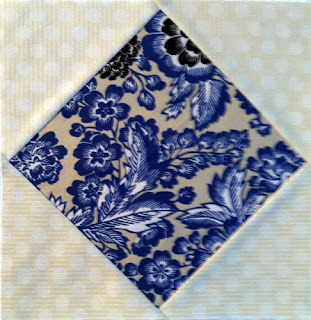 I will reveal more of this pattern, along with the full instructions as I finish sewing the blocks. 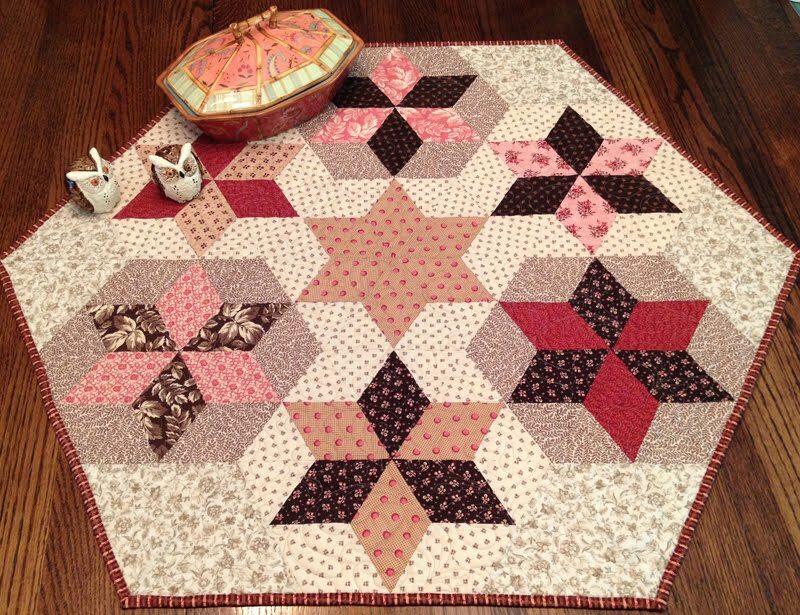 Don't be afraid of curved piecing; I have a no-fail approach that is sure to bring more than one "aha" moment! So, stay tuned for more "reveal" and the pattern, with full size templates. 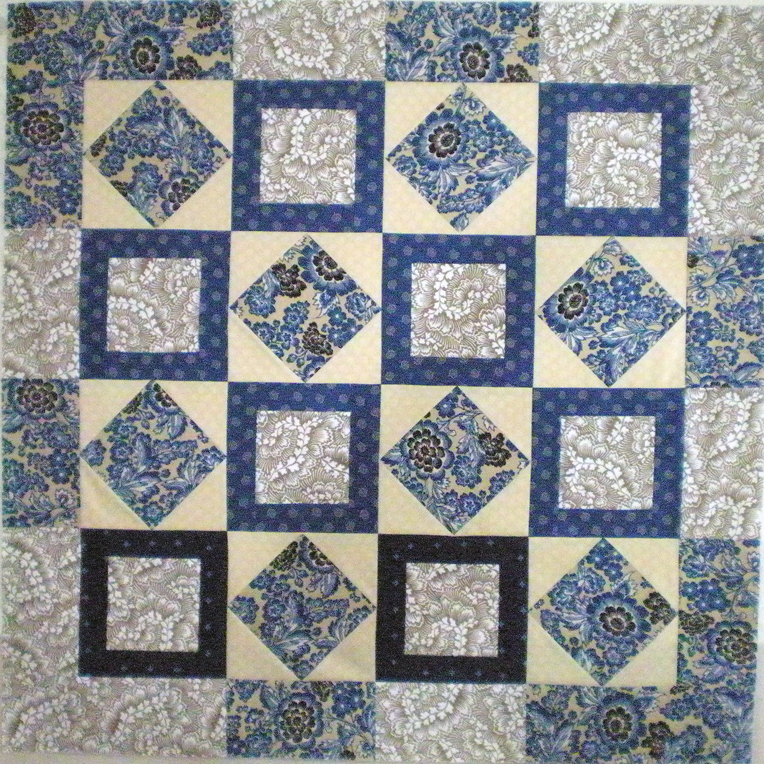 Moonstruck Block #2 - 9" x 9"
Block Size: 8" x 8" Quilt Size: 40" x 40"
Well, here it is, my Dylan quilt. I abandoned the plan to show off mirror image blocks and just sewed a few more of this color combination. The quandary? What should I do about a border? Well, I just tried to think outside the box; I'm so happy it's not predictable! 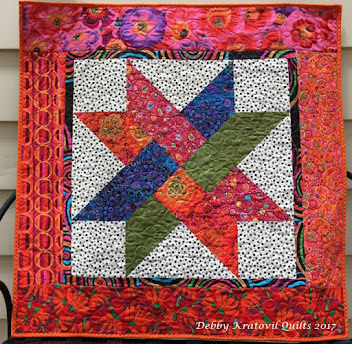 This is an easy quilt and can be sewn in one day. 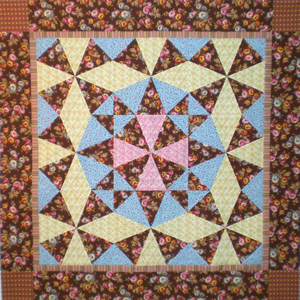 I will post the pattern and yardage later this week, along with a picture of ANOTHER, completely different quilt I'm hoping will be a new workshop. I emptied 3 out 4 suitcases from my teaching this past weekend. Now I've got to get back to work. It was so fun to play with beautiful fabrics from Windham. This has been my Win-Win-Win with Windham week. Hope you like this as much as I do! 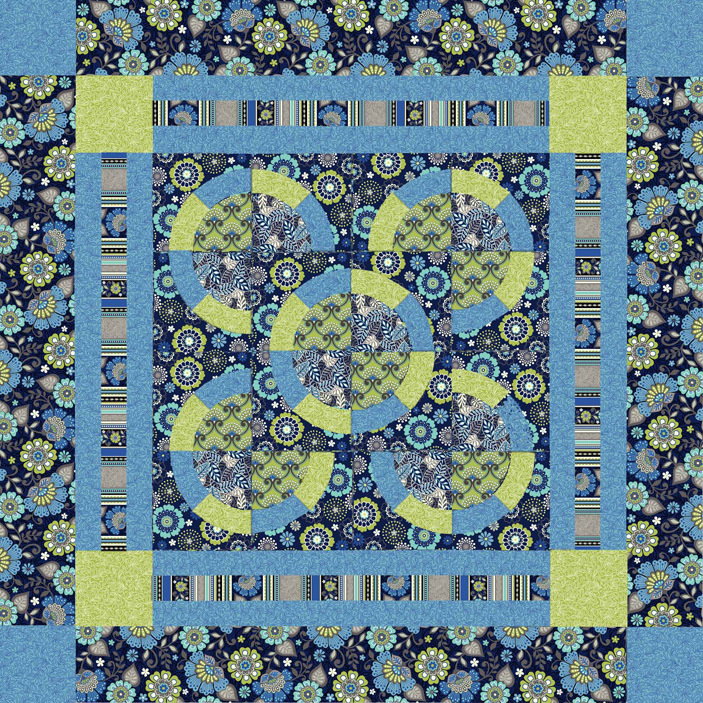 I partner with Windham Fabrics to create quilt designs with their gorgeous collections. 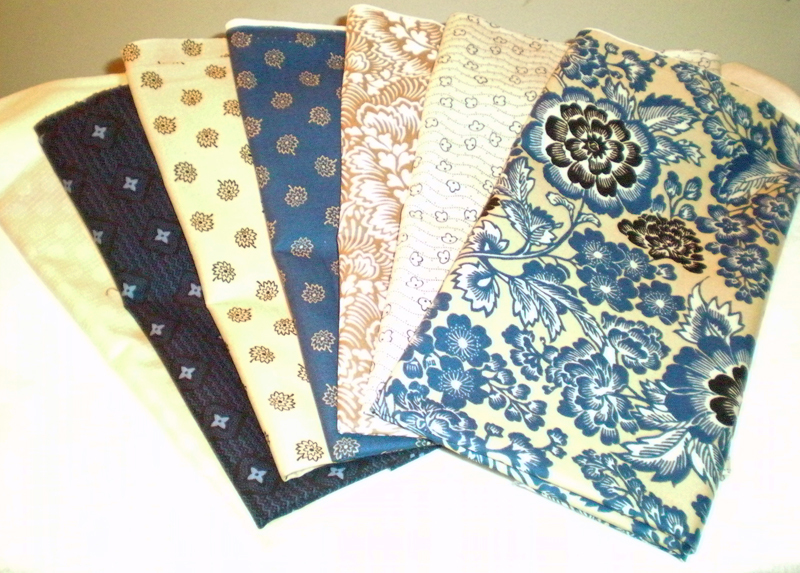 I received 1/2 yard cuts of the Dylan Collection by Whistler Studios a few days ago and I have allowed myself to sew yesterday and tomorrow, ignoring the suitcases that need to be unpacked, the laundry that needs to be done and other work that's not creative. 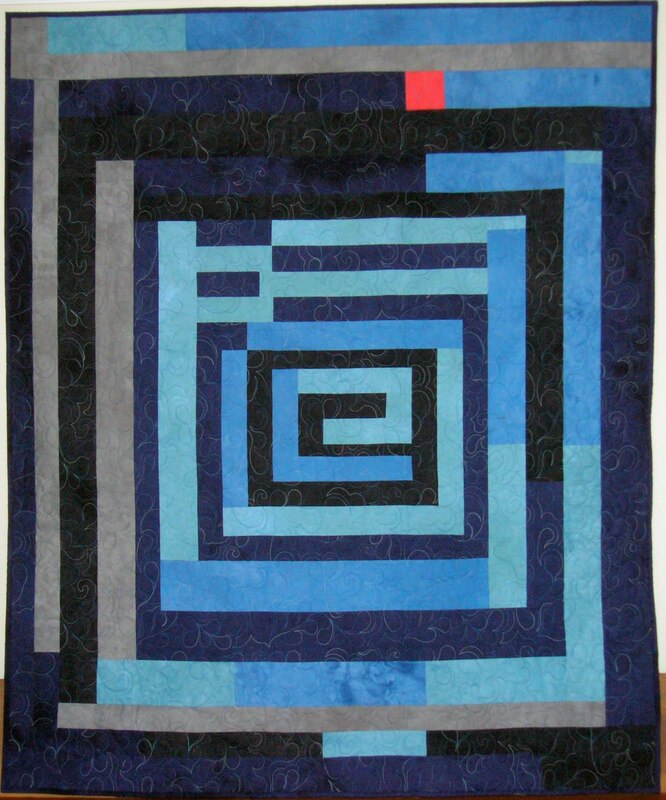 I have come up with not one but two quilt designs that I'm sharing here (one at a time). Warning! My photography leaves a lot to be desired! These lush floral prints in a simple color palette of black, blue, taupe and ecru give me a wide range of options. A variety of scale, color, big and small prints allow me to mix and match with a lot of options. OK? So, what is she doing with them, huh? Well, a very easy quilt . . . 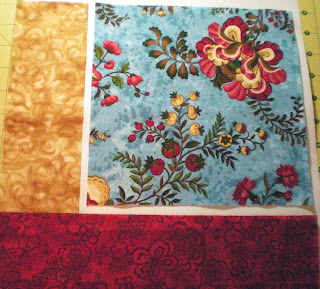 I am just test driving the fabric and I wanted a very easy quilt that ANYONE could sew both quickly and with confidence. I chose these two blocks so I could showcase the large scale prints. Why bother to use large florals if you're going to chop them up into little pieces? It is composed of two blocks, the first being the ubiquitous Square in a Square. I will upload instructions for making both these blocks by the end of the week. OK. So, what do they look like together? I'm so glad you asked! Can you see the star points in the center, around the middle Cobblestone Block? I am thinking of adding more blocks so it's not a tiny quilt, but I wanted to begin by showing you how two simple blocks can make the best use of a gorgeous print. The centers are cut 6-1/4" (Square in a Square) and 5-1/2" (Cobblestone), so that gives a good bit of space for the print. 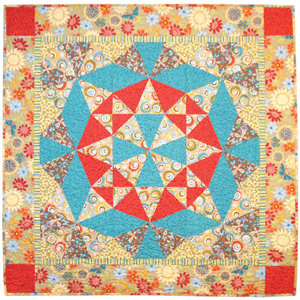 Check back TOMORROW for a mirror image of this quilt. I swapped the fabrics to create a different look to these same two blocks. 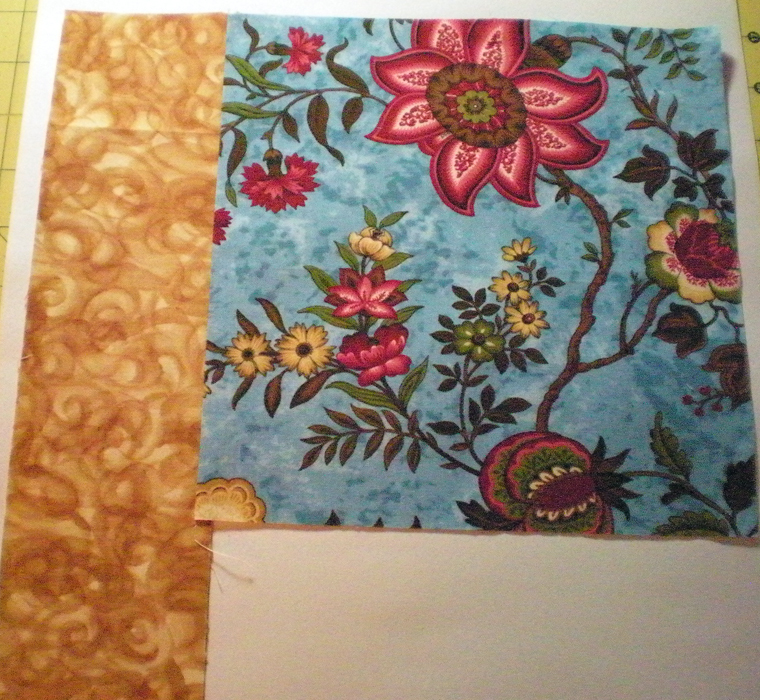 And I'm working on another, totally different quilt center using hexagons. I am hyperventilating with excitement over how beautiful this will be. I'll give you a little hint: it's part of my new series, Three Strips and a Ruler. Have to check back soon, that's all I can say. 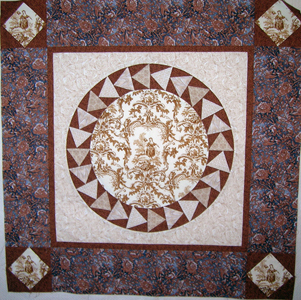 Click on the Windham Fabrics button at the top right of this page to see this and other collections. Visit their blog and search for the Dylan Collection (posted 6/25/2012) to see some home dec items to make with these fabrics. Getting Ready to Teach Fun Classes! I head off to the lovely Mount St. Mary's College in Emmitsburg, MD next week to teach 3 fun classes. 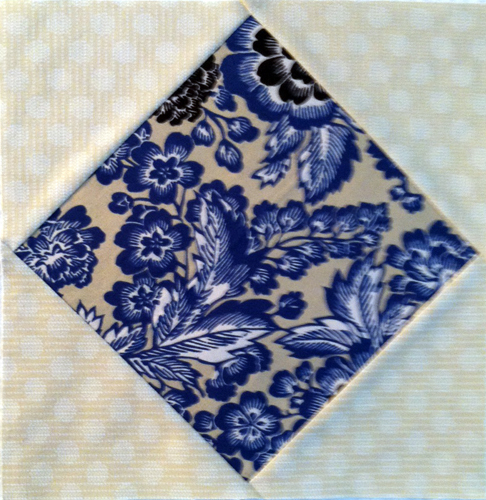 Two are projects from my upcoming book, Paper Piecing Perfect Points (Martingale, February 2013). Here is a picture of the book cover. I love, love, love that cover quilt. It's my happy quilt and I called it Katie's Garden. Lots of sharp points, only possible with foundation piecing (those are NOT tiny blocks, btw). 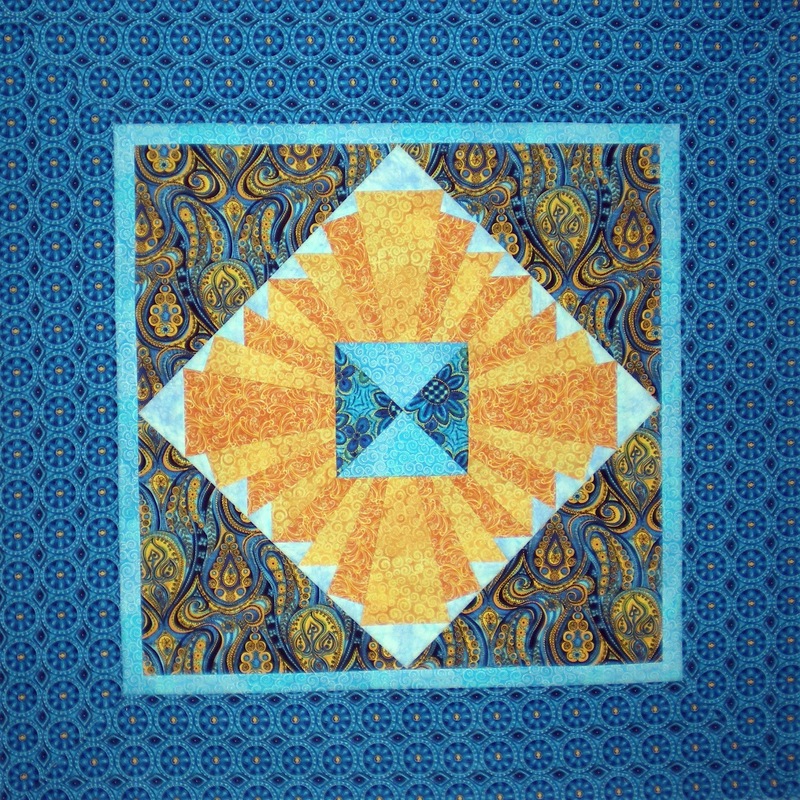 The Kaleidoscope Illusions is a class I taught with the Sewing Expo and the pattern is so versatile. 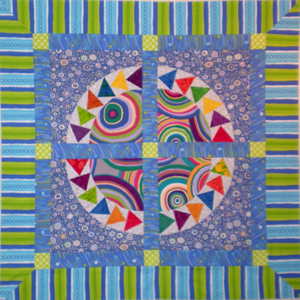 My pattern includes color step-by-step directions and a multi-size Kaleidoscope-Ruler to make up to 12" blocks. 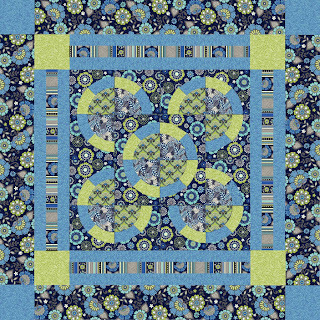 We will be working with just 3 different block colorings, but as you can see from the quilt below, you can get a different look when the shading and hue of fabrics changes. This is the class I am teaching on Friday, July 13. OOPS! I ACCIDENTALLY FLIP-FLOPPED THE SATURDAY AND SUNDAY CLASSES! I fussy cut the ladies in the toile and centered them for a spectacular statement. There are 4 center blocks, all joined and then the center is appliqued to the hole in the center. 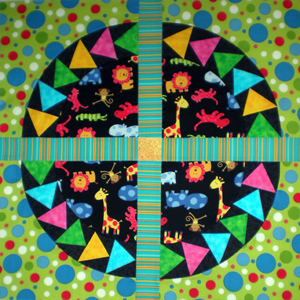 This little dinosaur quilt top was so much fun to sew. And I shocked myself my being able to sew that center circle into the Flying Geese ring with a 1/4" seam! It just goes to show you that when your sewing is accurate (and that's why I paper piece some quilts), the pieces actually do go together when you are accurate in cutting your templates. I will eventually get this quilted, but I love to show my students what's happening on the backside of a quilt. I love to answer the question: What If? 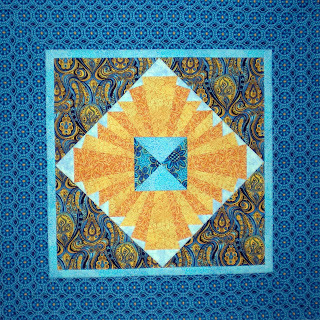 That is what took me to the next two quilts (yes, we are still in Saturday's class - students get the option of making the two different ways to treat the center). 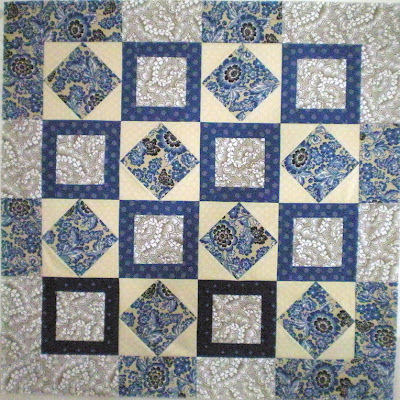 My Geese Have the Blues is what happens when the center circle is split and sashing is added. 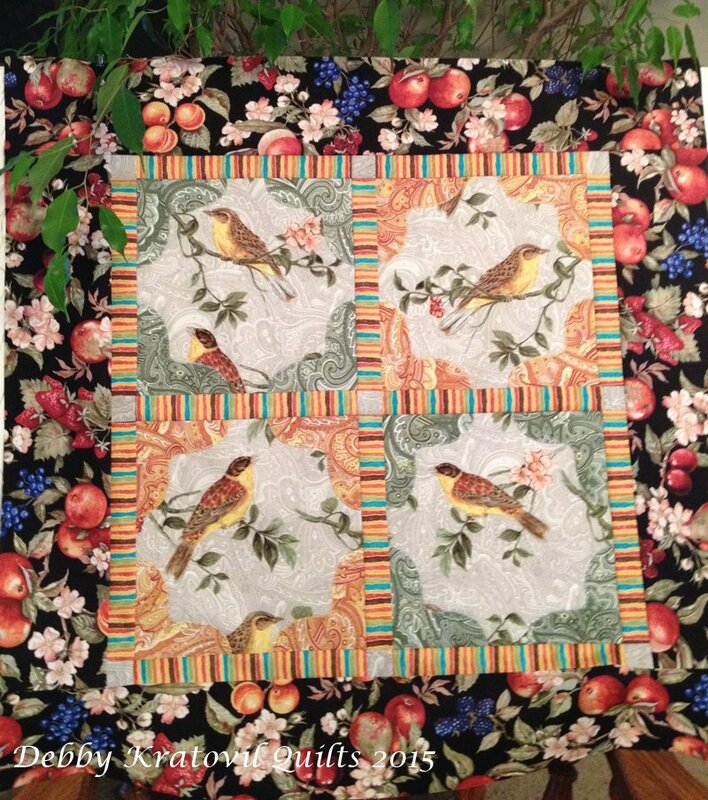 This quilt will be featured as one of 13 quilts in my 2014 Quilt Calendar (as will the Merry Go Round quilt above). I used some fun and bold fabrics for finishing up otherwise boring flying geese units. This also is one of my favorites. 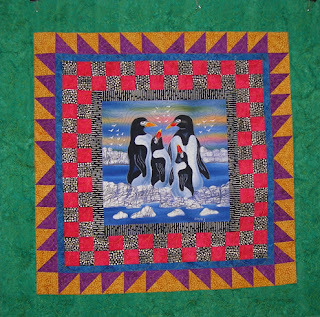 My Geese Have the Blues - 38" x 38"
This little quilt to the right with the children's circus animals is the same as My Geese Have the Blues. It needs a border, and it is not quilted yet. Again, I like to leave it that way to show my students how things should look on the back side. 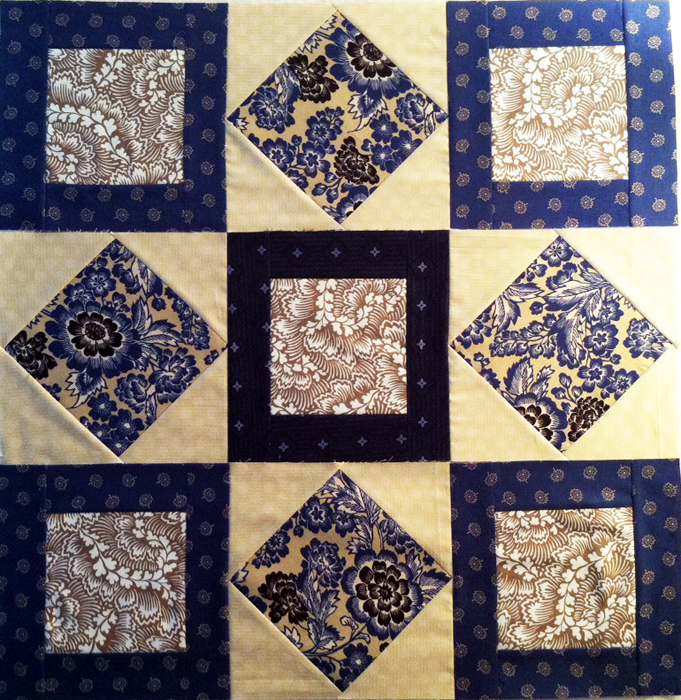 Each of the four units for the quilt centers are 12" finished. Sunday's Saturday's class is Casablanca Sunrise (also in my new book). There are 4 blocks 7" x 7", set on point. The name of that traditional block is Sunrise and the name of the Blank Fabrics Collection is Casablanca, so I wasn't very original. It was fun to use two different yellows for the spokes of that block. 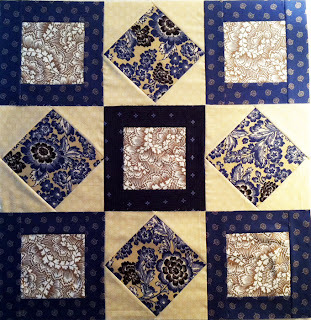 I have been piecing away and have one other larger quilt done which I call Milady's Fans (16 blocks, straight set). 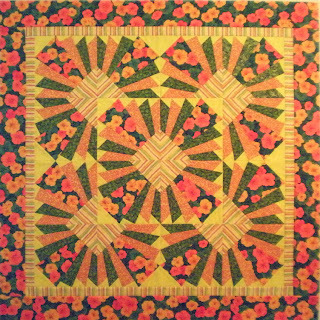 I squeezed every single inch of fabric from that bold orange and green floral which I bought for $2 a yard at a local quilt shop in their remnant bin. Sure takes on a fabulous look with that block, huh?